What we do Featured stories What If We Actually Gave People A Second Chance? Jazmyn Latimer, a designer at Code for America, spoke to Anthony 20 minutes longer than she expected. And in those 20 minutes, her whole perspective on the criminal justice system shifted. Jazmyn is the daughter of a corrections officer and comes from a family of police officers. Despite growing up in the midst of law enforcement, she didn’t fully understand the challenges within the criminal justice system until she joined the Safety and Justice team at Code for America. Investigating systemic issues from inside government and listening to people’s stories about how the system has affected their lives today completely changed her perspective. Jazmyn and Anthony crossed paths because of Clear My Record, an online service by Code for America which helps people with prior criminal convictions take advantage of laws that allow them to reduce or dismiss them from their criminal records once they have served their time. Anthony, a formerly incarcerated man, is using Clear My Record to clear his criminal record so he can find a place to live and a steady job. Jazmyn contacted Anthony for a user research interview, following up on his Clear My Record application to see how the process was going and how it could be improved. This phone call turned into an hour of listening to his stories -- of witnessing his mother’s murder when he was just nine years old, then moving in with his grandmother for a brief period of stability, before she died two years later. The subsequent years of uncertainty culminated in his being arrested for possession of cocaine at the age of 25 and sentenced to five years in prison. In the United States, one in four adults has a criminal record and 44,500 state and federal laws place restrictions on them, including limiting their ability to work in certain professions, pursue their educations, and vote. The potential benefits to families and local economies if these numbers declined are staggering. If people with criminal records were able to join the workforce at the same rates as others, it would result in an estimated $57 to 65 billion in economic output annually, increasing the United States GDP by half a percent. “I am not my past,” said another Clear My Record applicant. “I am more than my record.” But that is the story that a criminal record tells -- just one story, that does not represent the whole person. And that story can haunt someone for years or even decades after they’ve been released. Like Anthony, millions of people in California have old, typically low-level, offenses on their records that keep them from getting jobs, educational opportunities, and housing —many things they need in order to rebuild their lives. Proposition 47, approved by voters in 2014, greatly expands the number of people who are able to remove those convictions from their records, or reclassify them as lesser offenses —- IF you persist through the process, that is. This can be challenging because that process differs from county to county across California. In some jurisdictions, the best way to start that process is by going to a legal aid clinic, waiting in line, filling out long and confusing paper forms, then obtaining your criminal record from a police department or the California Department of Justice (which can add up to 4 weeks). Then, it takes at least two more weeks to hear if you’re eligible, more weeks to receive a court date, show up for court, wait some more to receive your court paperwork, and then do it all again if you have a conviction in another county. Legal aid clinics across the state have been key for delivering free, face-to-face legal services specifically for those seeking record clearance. Yet more channels are needed to help connect people with these opportunities and make progress toward closing the record clearance participation gap. The gap exists between the 8.4 million people eligible to clear their records and just 2% of those who are actually able to complete the process. This is where Clear My Record comes in. Of the applications that Clear My Record has received since it launched in April 2016, over half are received outside of normal business hours indicating that users are in need of easy, time-saving channels to start their application. User research shows that in-person events, like Clean Slate days, are key for getting legal guidance, but making these appointments can be a hurdle to get started. People may not live in the county where they have a conviction to be cleared, may not be able to obtain childcare, or have inflexible working hours. It’s no mystery why two years after Prop 47 went into effect about 6% of eligible people in Los Angeles County had had their petitions processed by the courts. 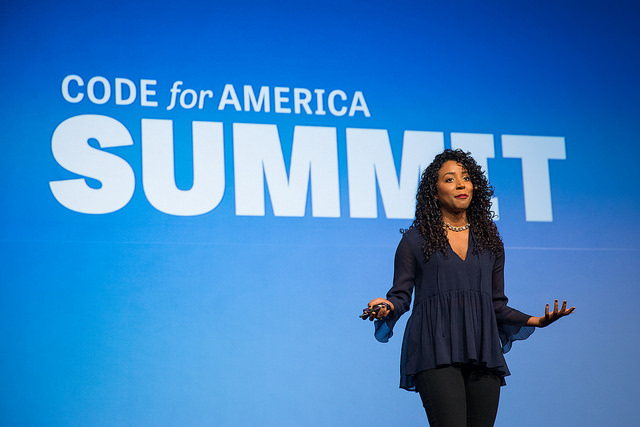 Instead of a challenging process, “What if we actually gave those people a second chance?” Jazmyn asked, during her presentation at the 2016 Code for America Summit. “What would it look like to do this right?” Jazmyn asked. This was the question the Clear My Record team set out to answer. The Code for America team wanted to say more than “I hear you” and “I’m sorry,” after listening to applicants’ stories of individuals struggling to understand the unintelligible and often inaccurate content of their criminal record documents. The team wanted not only to help applicants get through the process, but also relieve some of the pains that attorneys were dealing with, by streamlining communications with applicants to help them navigate the process. The result? An application that takes on average 10 minutes from a mobile phone or a computer that helps people determine eligibility in as little as one to seven days, compared to up to three months, which was how long it was taking when we started the project. This is what giving people a second chance looks like. It means not having to take time off work. It means not having to be an expert in the legal processes in each county where you may have a conviction. It means giving attorneys and legal aids more tools to better serve their clients. Clear My Record has helped more than 2,800 Californians apply to clear their records, and the team has plans to serve applicants statewide in California by the end of 2017. Justice means many things to many people. In the case of Anthony, and countless others like him, justice means getting the implementation right. It means a well-intentioned policy like Prop 47 can only reach its full potential, and get the outcomes voters intended, when its implementation can meet people where they are and truly serve people who need it most. This story is based on a presentation delivered at the 2016 Code for America Summit. You can view the full video of Jazmyn’s presentation here.